I rarely drive out of my way for curb alerts, but there was one on a recent Sunday morning that sounded promising, and wasn't too far from my route to Jazzercise. Any time something is described as midcentury it's worth a second look. I knew they'd probably be gone by the time I arrived but it was worth a try. Score! 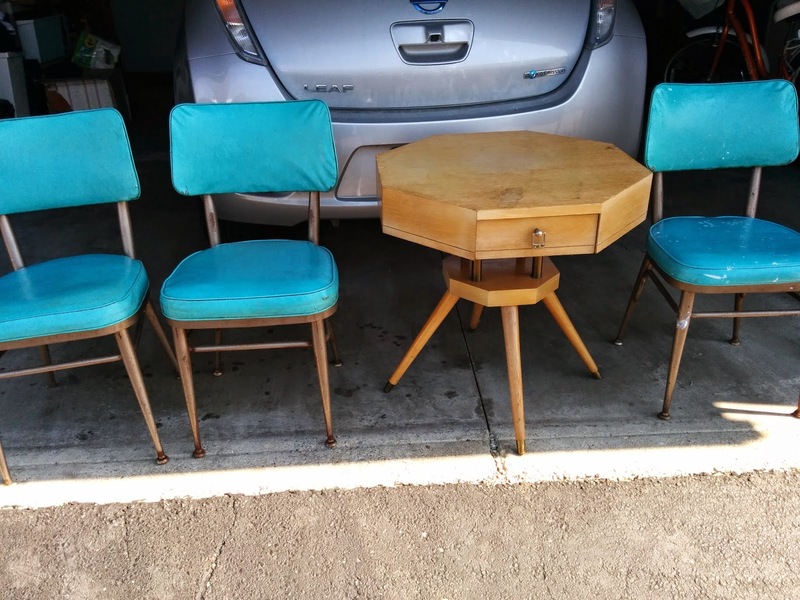 I scooped up three vintage aqua chairs and an octagonal side table. They're all in rough shape, but have good bones. The teal upholstery is probably beyond saving, but I'm going to try to clean off the paint splatters and grime. The legs need sanding and painting, and some of the feet are missing. I'm hoping to make two good chairs out of three ragged ones. The blond wood veneer is chipped, but I plan to paint it anyway, so I'll just use wood filler and sandpaper to smooth out rough areas. Bonus-I've never driven on that particular road before, and across the street from my destination, I found two rickety plant stands and some nice wood from a broken crib on the curb. I love free stuff and my garage has a designated future projects area where cruddy things with potential await new life. But once it's full, I cut myself off from bringing in more, or have a strict one in, one out rule. I've heard a lot of negative, and sometimes tragic, stories about Craig's List over the years, and have had some weird and scary encounters of my own. If you're buying or surfing curb alerts from Craig's List or another source, be cautious. Always tell someone where you're going, and how long you expect to be. Meet in public places if possible. You know the drill.